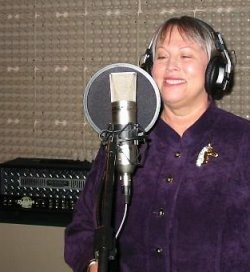 Working with author Donna Mann on creating a website for children’s stories was an opportunity to bring my 25 years of teaching experience to a new role as Narrator. 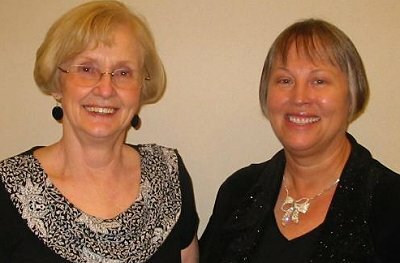 With Donna Mann at Meadowlane’s website launch in November, 2009. My story of how MeadowLane Audio Stories was birthed is a little different from Donna's. While exploring the publishing world, I consulted Donna who had offered to share her wealth of knowledge in this field. We spoke about many details, like being careful about copyright issues and respecting artists when an author uses clipart or photographs to enhance a piece of writing. 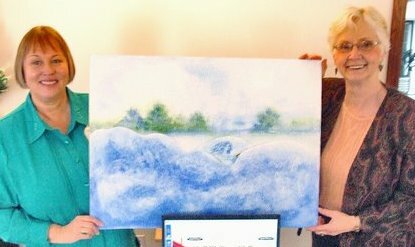 Donna showed me some of her self-published material and other work waiting to be published. As she showed me story after story of her Grammie books, written for and with her grandchildren, I knew that I wanted to read all of them. I was immediately convinced that lots of other people would want to read them too! Isn't that always the way? We can often see the treasure in other people's work, even before they acknowledge it themselves. Humility is a beautiful trait; yet, sometimes we can all benefit from a little nudge to let our light shine on a whole new audience. It is my honour and privilege to narrate Donna's uplifting tales of real farm animals, whimsical creatures and lovable kids.